Have I ever reviewed snacks outside of a favorites post before? I don't think I have - but I'm excited to do it for the first time and perhaps do it some more in the future if it's something that interests you guys! Now, I have to be honest... When it comes to how I feel about food, I'm really neither here nor there about organic, but sometimes the organic section of the grocery store is where you're going to find some of the healthiest snacks. For me, I'm trying more and more to be aware of what I'm snacking on and make healthier choices, while still giving myself something that feels a little like an indulgence. 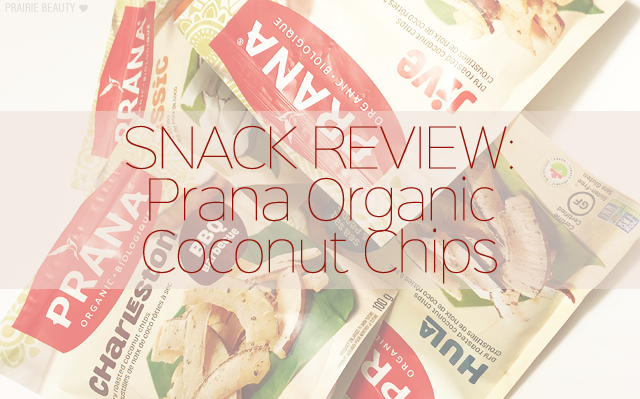 This is why when I had the opportunity to try out the Prana Organic Dry Roasted Coconut Chips*, I jumped on it. I mean, who wouldn't be intrigued the first time they hear about coconut chips? And a chip that's dry roasted? YES! Doesn't hurt that Prana is a Canadian company, either! Keep reading to learn more - you know you're curious! 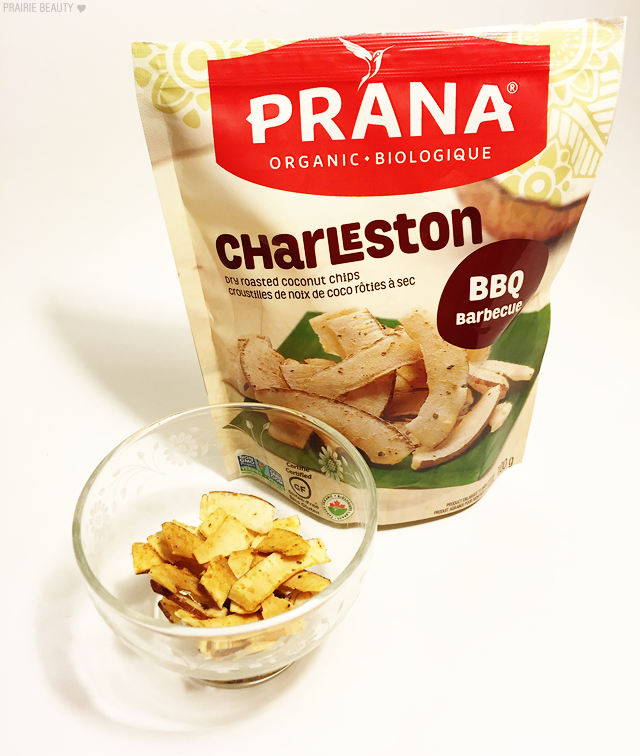 "Prana Organic Dry Roasted Coconut Chip offer a unique and exotic taste, and are also 100% organic, gluten free, with no cholesterol, and offer an excellent source of fibre. 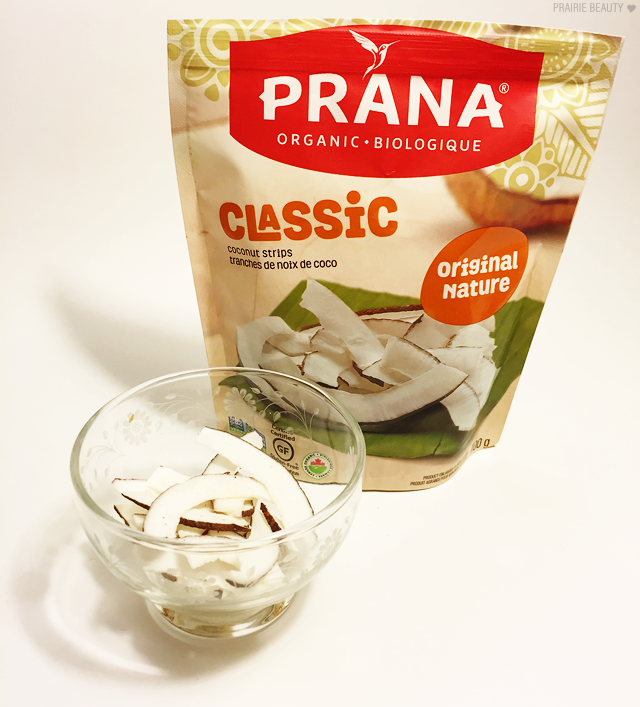 True to Prana's commitment to quality, coconut slices are dry roasted to perfection and seasons with ingredients from around the world to create a snack with a unique and exciting taste. 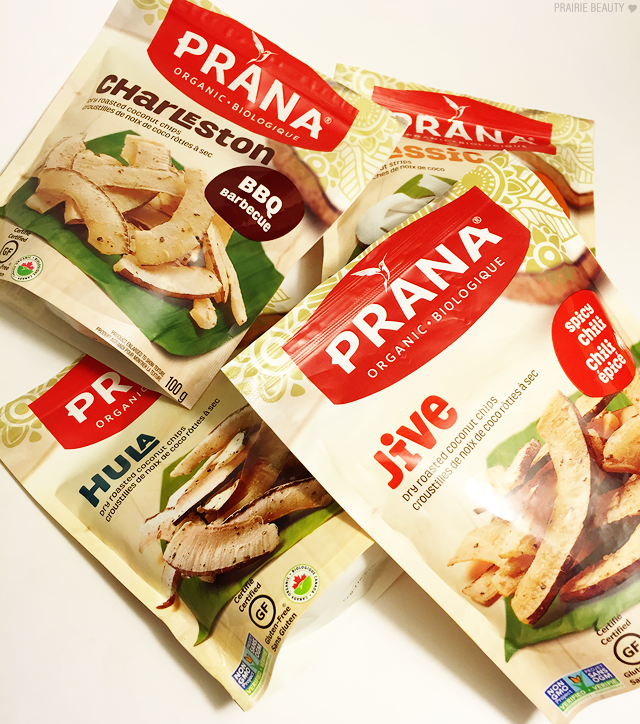 Nutritious and crunching, Prana Organic Coconut Chips are available in 4 homemade original flavours named after a popular dance from around the world: Jive, seasoned with chili and exotic spices; Hula, with sea salt and cracked black pepper; Charleston, with a proprietary rich and unique BB mix; Classic, just pure authentic wholesome coconut." As you can see from the picture, these are just pure strips of coconut dry roasted to a dry-but-not-entirely texture that has a little bit of flex and chew. For me, I don't really like these to snack on by themselves because I find them a little bland, but I'm definitely going to find ways to use these in recipes because I think they'll work really well for baking as well as adding to trail mix with nuts and dried fruits. Hmm. These ones aren't my favorite. I'm not sure what it is about the combination of coconut flavor, which these chips definitely have, and BBQ, but it's just not suited to my personal tastes. The BBQ flavour is nice, don't get me wrong, I just can't make myself like the combination of it with the coconut. NOW WE'RE TALKING! I think that this is giving me exactly what was missing with the first two flavors and that is salt. These don't really taste salty to me, but I think the salt brings out the depth of the coconut flavour and somehow the pepper rounds out the flavor to make it make sense on my tongue. These are delicious and I could sit down with the bag of these and munch on them on my couch any day. So... Yeah... I SAVED THE BEST FOR LAST. I have to admit that before I started taking the pictures for this blog post, I had TORN through this bag and there were only crumbs left for the pictures. Because I am a monster and these are monster food. What? I don't know. These are so delicious that I can't even stand it. The first bite I took, they instantly reminded me of Thai curry with a complex blend of spices, a little bit of heat, and that smooth grounding element of the coconut. Yes, yes yes. If you're going to try just one of these, this is the one that gets my huge stamp of approval. Like, really really huge. YUMMY. I have to tell you guys, I'm so glad that I decided to try these out, because the Hula and Jive flavours are absolutely out of this world and I love having a new snack on my radar that isn't quite so hard on my conscience and my waistline. Also, I love that there is actually nutritional value to these, because with a lot of these types of snacks even if they're not bad for you, they often aren't doing anything good either. 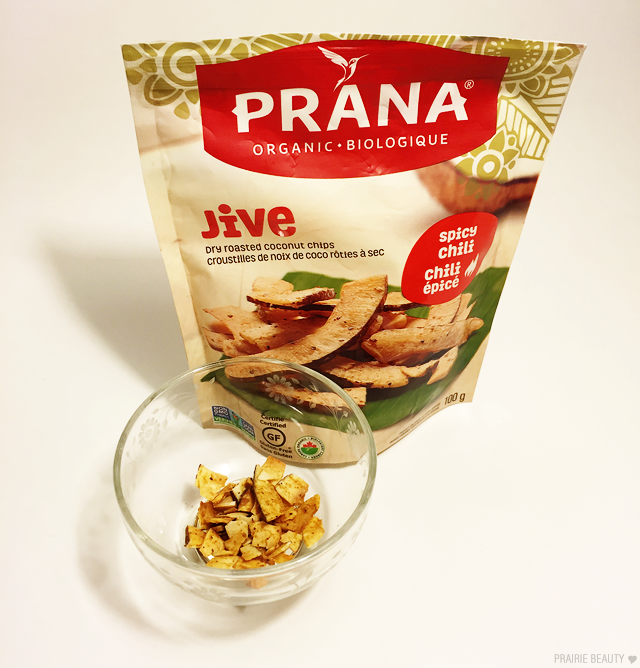 PRANA is a family owned company out of Quebec whose products are all certified organic, Kosher, vegan, preservative-free, gluten-free, GMO-free, & sulfite-free. If any or all of those are important to you in making your food choices, this is definitely a brand to consider. And really, you should try the Spicy Chili Coconut Chips first! 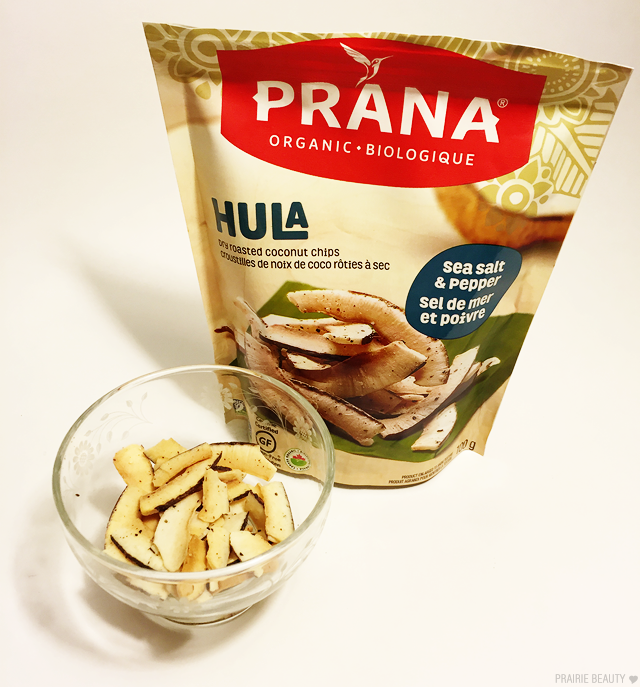 These are available in grocery stores and health food stores across Canada!